A new close-up view of Mars' "High Dune" is the first-ever close investigation of the dunes, which can move about 1 yard (about 1 meter) per year. It's a familiar view to those who watched Matt Damon's character, Mark Watney, fight for survival in "The Martian," yet it's one we've never actually seen up close until now: rippling sand dunes on Mars. Although NASA's Curiosity Mars rover took images of the sand dunes from a distance in September, this new image from the rover is the first to show an up-close view of the Red Planet's sweeping dunes. The photo's star is a dune informally named "High Dune." High Dune's portrait is just the first step in NASA's mission to investigate the dark sand dunes, some of which stand up to two stories tall and shift about 3 feet (1 meter) during an Earth year. The rover, which acts as an on-the-go laboratory, will soon scoop up and analyze some of the sand. The dunes around Curiosity, called the Bagnold Dunes,sit inside the planet's huge Gale Crater and line the northwestern flank of Mount Sharp, a layered Martian mountain that Curiosity reached in 2014 after a 14-month journey. The dune investigation is just one part of Curiosity's greater mission to examine Mount Sharp layer by layer and learn more about the planet's geological history. 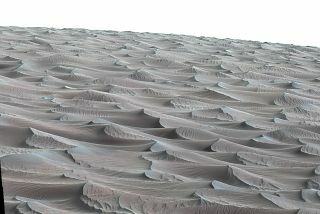 Another part of the new photo of Mars' "High Dune," taken by the Curiosity Mars rover. Curiosity has been on the Red Planet since 2012.